Wherever and whenever you walk, you will see people with their heads bowed to their smartphone screens. The "bowed head tribe" - or dī tóu zú - is already a Chinese term for people with "their heads lowered, gazing at their phones" (BBC Future, 2016). Usually, a bowed head also reveals a kind of submission, in this case towards Technology. Netflix released a picture of this "bowed head tribe" for promoting the 2016 episode Nosedive of Black Mirror (IMDb, The Verge). Wiki: "The episode is set in a world where people can rate each other from one to five stars for every interaction they have, and which can impact their socioeconomic status." "China: from Hukou to Social Credit". Yesterday's FT featured an article with an intriguing analogy in its title: "Why quitting smartphones is the new quitting smoking". I have already minimised my notification alerts. My iPad and iPhone are usually also beyond arm's length. Nevertheless, I know deep down that I'm addicted to my devices. This addiction is also known as FOMO, the Fear Of Missing Out (my 2016 blog). In contemporary society, there are several trends: a decline in Religion (or secularism - my blog), an increase in Technology (my blogs), and an (ongoing) increase in Urbanisation (my blogs). I think, feel and believe that these trends are connected. Urbanisation, the oldest trend, might be the (silent) driver behind the decline in Religion and increase in Technology (and others). There are two most impressive videos (about 3 minutes each) that I recommend watching: the History of Urbanisation from 3700 BC to 2000 AD based on a 2016 study published in Nature, and the Earth's history from a Time and a Technology perspective from Business Insider. 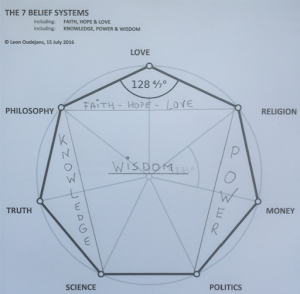 The decline in Religion and the increase in Technology are the reasons for my prediction that there will be a future swap in the Knowledge and Power dimension of the 7 Belief systems. Currently, we (still) have Science (including Technology) in the Knowledge dimension, and Religion in the Power dimension (next to Money and Politics). Technology (including Science) is already moving towards the Power dimension. Faith (formerly named Religion) will be moving to the Knowledge dimension (my blog). I am still considering what this will do to the old proverb "Knowledge equals Power" (eg, Francis Bacon, Michel Foucault).